Versatle design allows for quick conversion into a high powered blower while the huge filter capacity contains large amounts of debris. Ideal for Office Buildings, Outdoor entryways/Sidewalks, Office Campuses, Universities, K-12 Schools, Hotels, Industrial Facilities, Large Meeting Facilities, Theaters, Construxction sites. The megavac powers through the toughest industrial and construction clean up jobs. 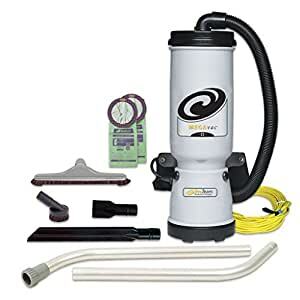 Featuring a powerful motor and a 10-quart filter Capacity, this backpack vacuum provides superior efficiency and uninterrupted performance. This unit comes complete with blower tool and hard surface horse hair brush tool kit.